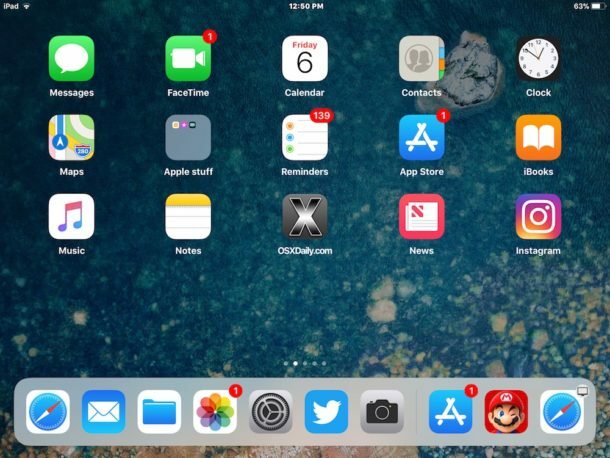 One of the various new features introduced to iPad with modern iOS is a revamped Dock, complete with a new Recent and Suggested Apps section that appears on the far right side of the iPad Dock, delineated by a faint separator line. 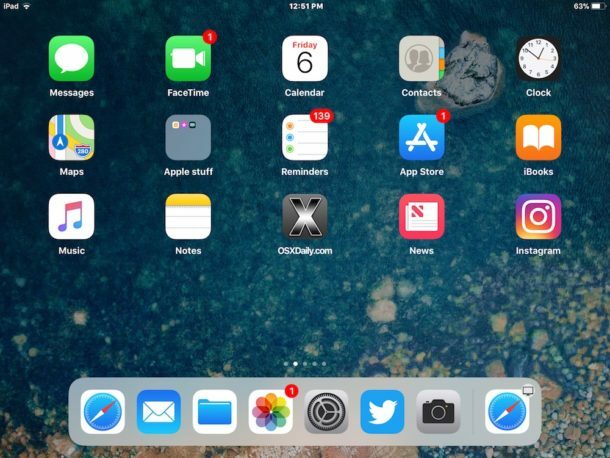 Most iPad users will appreciate having the Suggested Apps and Recent Apps section allowing for easy access to apps that were accessed recently or that are often used, but for those who don’t want to see those Dock items they can be disabled. Maybe you prefer minimalism, or maybe you don’t want to offer any leads on what apps you were recently using or use often. 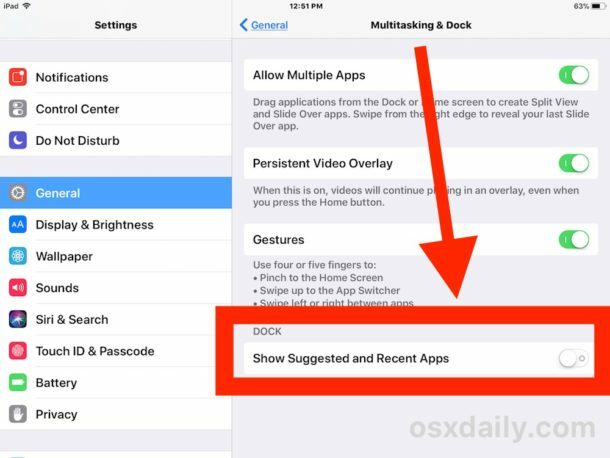 In any event, here’s how to hide and disable the Suggested and Recent Apps feature of the Dock for iPad in iOS. Note the Suggested and Recent Apps capability is only available to iPad users with iOS 11 or later installed on their device, neither the setting or feature is available in earlier iOS releases or on other iOS devices. Once the setting has been turned off, if you return to the Home Screen or flick open Control Center on iPad you will notice the right side of the Dock has fewer icons visible now. The “Show Suggested and Recent Apps” feature will show up to three apps that are either suggested or recent. The suggested apps are learned and generated over time based on app usage habits, and the list will change periodically throughout the day and periodically depending on what apps you’re using. Returning to the Home Screen or the Control Center to reveal the iPad Dock will show the recent apps feature available and visible again. What about the other Dock icon that sometimes appears on the far right side of iPad Dock? If you disable “Show Suggested and Recent Apps” and still find an occasional icon appearing on the far right side of the iPad Dock, like what is shown in the screenshots here, that icon is likely from Handoff. The Handoff capability is identified by a little device badge hovering over the app icon, and the Handoff feature lets you pass app sessions from one iOS device to another iOS device or Mac, and vice versa. To hide that apps Dock icon as well, you’d need to disable Handoff on the iPad. In disabling the suggested and recent apps, is there a reason the Safari icon, on the far right hand side of the dock in your example, stays on the dock? Yes. 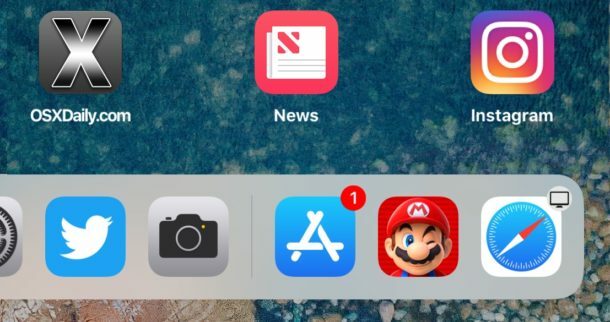 The reason why that icon stays in the dock is that it got there because of the handoff feature that lets you pass app sessions from one device to another (hence the little badge on its top right corner. They did mention that near the end of the article. You probably have another device, like a Mac, with a website open in Safari, and Handoff is suggesting that you can open the website on this device too. Sometimes I think people on the internet should have to answer a quiz about what they’re about to comment on before they can comment online, it’s clear the majority of people read a headline only then jump right to the comments. Nobody reads anymore, total ADHD generation. Perhaps yourself and the author of this little doco should take the quiz…Suggested Apps is NOT shut off by your method. This didn’t work either for me. Confirmed. The above ‘fix’ does nothing. The Safari icon stayed, as it has the ‘handoff’ mode applied. Small icon on the safari icon. As stated, disable Hand-off, and icons in that mode will not show in the dock. What are some good uses for an iPad, other than web browsing, checking mail or watching a movie? I am trying to justify getting one. Diana, I wanted the 256GB 10.5″ iPad Pro for doing most of what I do on my iMac, but in my comfy chair, the tub, the garage, riding in a car, and yes, the commode, sorry. Also I see my entire photo library, play all my music, listen to audiobooks, send text & email, answer & make phone calls using wifi at home, control both my TV & my iMac from my comfy chair, take gorgeous photos anywhere/edit them, then save them to the cloud if I choose. Oh, tell me the time and wake me up. Okay, now how do I get rid of apps on the far right that have a little alarm clock symbol on them? I turned off both handoff and recent/suggested apps, and it remains. The only apps that I use are already in the dock, so having them in the dock again, showing up just as I’m trying to click on something so I click on the next thing over instead, is very frustrating. I have the same frustrating problem. After reading up at Apple support, I found an answer. In the today screen (swiping left to right), I edited the “Siri recommended apps”. Actually removed it from the Today list! Seems to have worked for me! No more annoying icon with little alarm clock! Hope this helps. This doesn’t work for me: I have an iPad Air that I use for work, but I have the Netflix app on it. The Netflix app is showing on the far right of the dock with an alarm symbol on it, but nothing I do removes it. I’ve tried switching off the suggested/recent apps, but this just removes any other suggested or recent app, not the Netflix one. It’s driving me crazy! I watch downloaded shows on the bus to and from work. If this is Siri showing me that I normally use Netflix at this time, that’s of absolutely no help to me whatsoever. Yes, this is infuriating! I don’t want Netflix in my dock, ever!! Is there a way to make the dock not pop up while I am scrolling through a webpage or news article? Both are littered with ads and pictures that are way to eager to go full screen when I don’t want them to, and sometimes the only safe part of the screen to scroll from is near the bottom. This causes the dock to pop up when I don’t want it to, because I never want it to. Now that the timeline for videos is also at the bottom of the screen, trying to rewind or fast forward a video brings up the dock and interupts the process. I know the Apple engineers are super proud of their new “feature”, but I find it irritating AF. I would also like to get rid of the icons that have the alarm clock icon from the dock. I want an uncluttered home screen of my choosing, not a screen that somebody else decides I must have. Doesn’t work for me. Can’t even drag it downwards very far. None of the solutions in this thread works. I can’t seem to edit the “Siri Suggested Apps” box on what I assume is the “Today” screen. That alarm clock icon is making me nuts. This is more than frustating. The multiple problems I’ve had with all of my Apple devices is making me want to leave Apple forever.